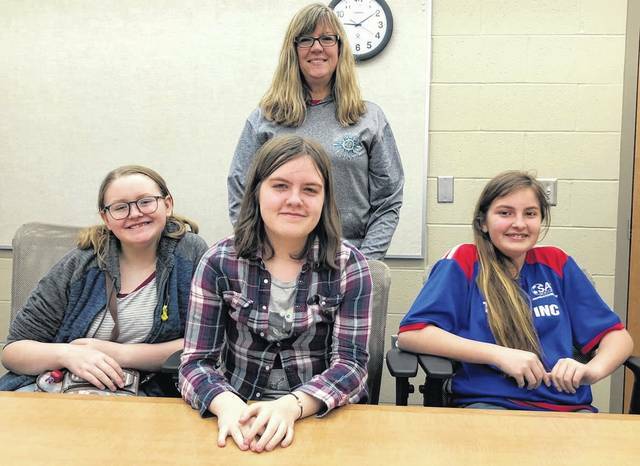 Scott Halasz | Greene County News Greeneview middle school students Allison Mussetter (left) and Carmen Kell (right) qualified for the state Power of the Pen tournament in May. Kendal Allen, also part of the Ram Writers, just missed out on a trip to state and is going to help support her teammates. Also pictured is teacher Carolyn Jones, who leads the Ram Writers group. JAMESTOWN — When it comes to prepping for a Power of the Pen competition, just showing up is the real challenge for Carmen Kell. But once she conquers that fear and walks into the first 40-minute writing session it’s a cinch. Kell proved that at the regional tournament held recently at Wittenberg University. Out of 78 writers, she finished eighth and qualified for the state tournament May 24 at the College of Wooster. She will be joined by fellow Ram Writer Allison Mussetter, who finished seventh out of 78 in the eighth grade and earned her second trip to a state writing tournament. Each writing session featured a different prompt and was scored by two judges. From the district competition 50 percent advanced to the regional, while just 25 percent advanced to the state tournament. Kell and Mussetter each had two first-place finishes, one second-place finish, and two third-place finishes. Mussetter didn’t receive any medals last at last year’s PenOhio state competition, which was open to middle school teams in lieu of a one-year hiatus of Power of the Pen. In reality that was the least of her concerns when looking back. “Last year the competition was a mess, she said. “I didn’t put my full effort into it. I’m not as good writing on paper as I am at home writing on my computer. (And) it was supposed to end at 3 p.m. and we didn’t home until almost midnight. In fact, it was an event she would rather forget so whatever happens this year will be better. Kell isn’t sure what to expect from her inaugural trip to the state event. Ram Writers coach Carolyn Jones is equally amazed about her team. A third teammate, Kendal Allen, is making the trip to Wooster although she didn’t qualify. The eighth grader — who joined Ram Writers around Christmas time — will be a runner and support person for Kell and Mussetter. She narrowly missed qualifying, likely due to a fourth and fifth-place score from the judges in two sessions. Ram Writers meet once a week and practice writing off prompts and general writing. ”The practice writing really helped me,” Mussetter said. The trio heads to Wooster May 23 and begins writing the next day. https://www.xeniagazette.com/wp-content/uploads/sites/32/2019/04/web1_IMG_2752-1.jpgScott Halasz | Greene County News Greeneview middle school students Allison Mussetter (left) and Carmen Kell (right) qualified for the state Power of the Pen tournament in May. Kendal Allen, also part of the Ram Writers, just missed out on a trip to state and is going to help support her teammates. Also pictured is teacher Carolyn Jones, who leads the Ram Writers group.